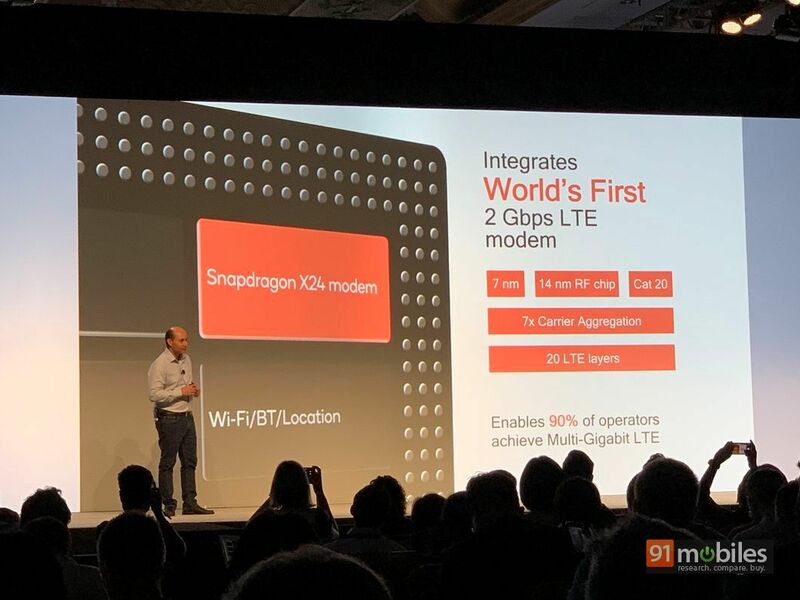 Qualcomm’s top-end mobile processor is a big deal each year, for the simple reason that most smartphone brands utilise the same in their flagship smartphones. In simple worlds, the capabilities and features offered by Qualcomm’s top-of-the-line SoC are what drive the user experience for most flagship smartphones in the coming months. 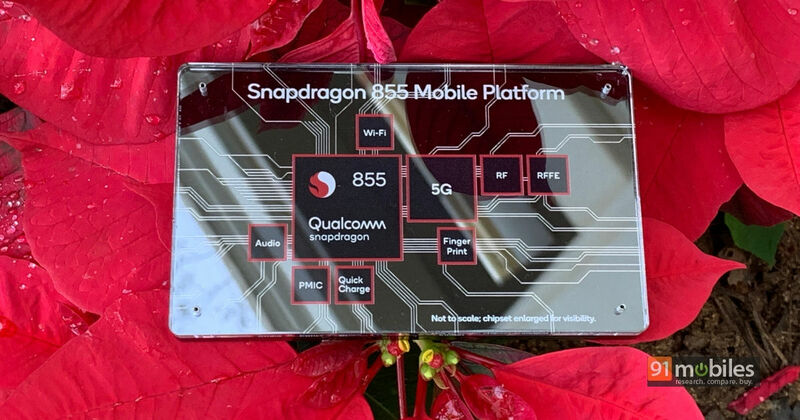 And with the details on the new Snapdragon 855 SoC out, we can now attempt figuring out what all we can expect from flagship smartphones in 2019. And judging by what we’ve heard from Qualcomm, we can sure expect quite a bit. Let’s take a look at what all the SD 855 chip has to offer. 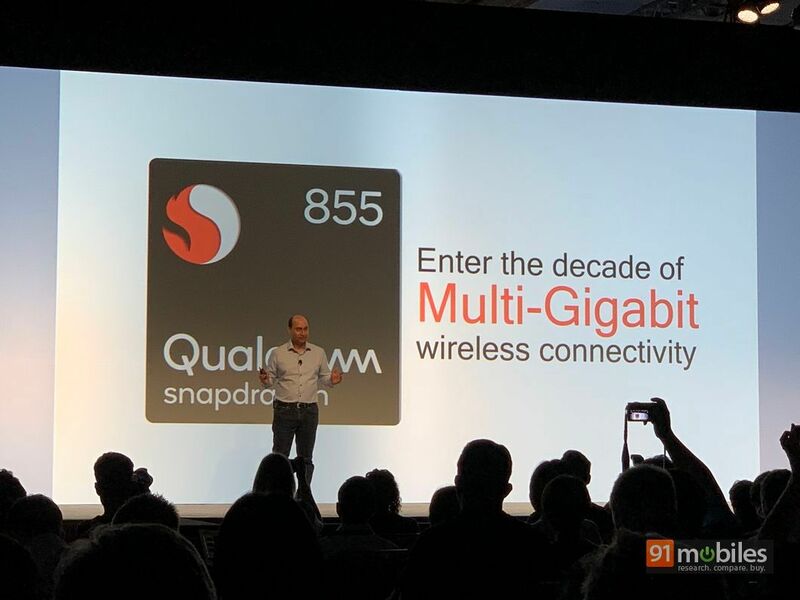 With the Snapdragon 855, Qualcomm has now transitioned to a 7nm fabrication process that offers significant advantages in terms of both performance as well as power consumption. While the SD 855 is by no means the first 7nm SoC, as Huawei’s Kirin 980 and Apple’s A12 Bionic chips also utilise the 7nm fabrication, the SD 855 does claim to be much better in comparison. Here’s how. First up, performance. 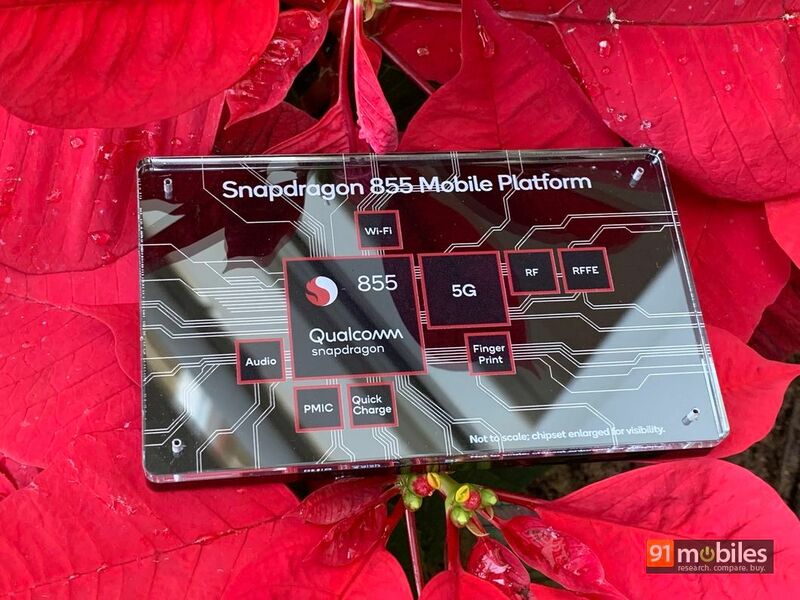 The Snapdragon 855 chip promises a 45 percent performance boost, and a 20 percent boost in graphics, when compared to the Snapdragon 845, all thanks to the new Kryo 485 CPU and Adreno 640 GPU. The Kryo 485 CPU includes one prime core, three performance cores, and four efficiency cores to balance raw number crunching and frugal power usage. 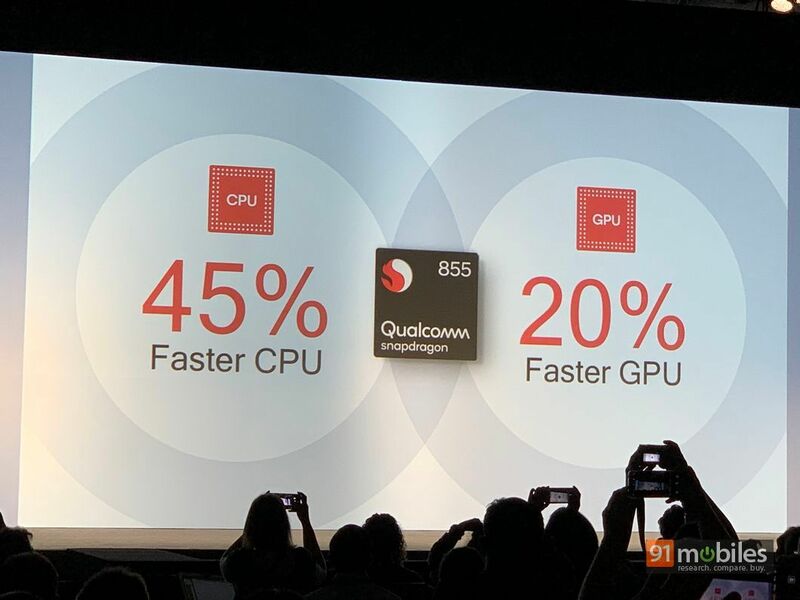 That’s the reason why Qualcomm is claiming up to 30 percent less power consumption with the 855 as compared to its predecessor, effectively translating into a meaningful bump in the all-important battery life, an aspect that assumes even more significance while indulging in activities like steaming high-res video over 5G, gaming and XR (short for Extended Reality, a term that covers both AR as well as VR). Next up is connectivity. The real takeaway here is that while the SD 855 can be considered as a realistic vehicle for delivering 5G, the SoC will actually come with the X24 modem, which is limited to LTE. Manufacturers wishing to include 5G in their devices will have to make use of the optional X50 modem. That said, the Cat 20 X24 modem itself promises speeds up to a whopping 2 Gbps, and features carrier aggregation as well as 4×4 MIMO. The SD 855 SoC is also supposed to be the world’s first W-Fi 6-ready solution for mobile, including support for 802.11ay and promising up to 10 Gbps speeds over 60GHz. As far as AI is concerned, there are some big promises in this aspect too. 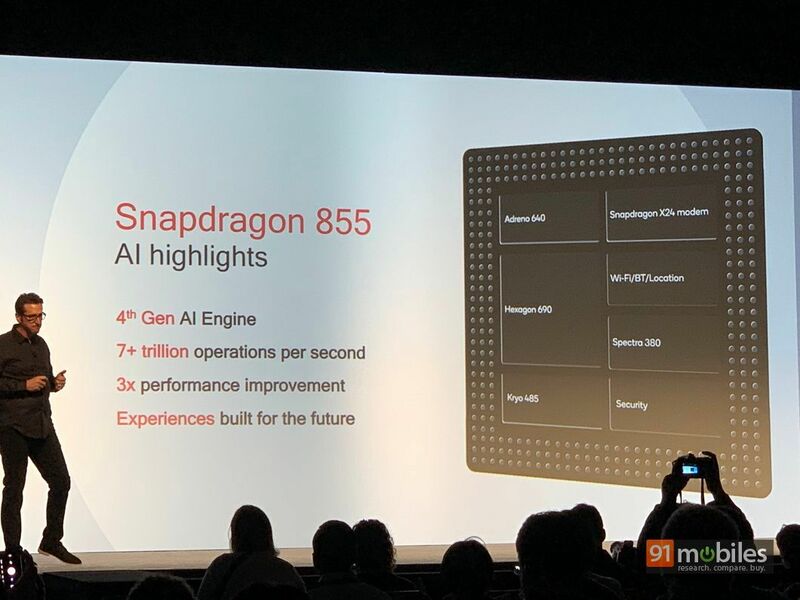 With the Hexagon 690 processor responsible for handling AI, the Snapdragon 855 SoC brings Qualcomm’s fourth generation AI engine to the table, with a total capacity of more than 7 trillion operations per second. Qualcomm is claiming a 3X boost in AI tasks as compared to before, and double the performance of rival chipsets. The San Diego-based chipmaker used a bunch of demos and partnerships to highlight the AI capabilities of the new SD 855 chip, including one with Google to show how object and photo recognition will improve on the Google Lens. Qualcomm has utilised Google’sTensorFlow library for on-device processing of AI tasks such as text recognition and other vision-related stuff, and all of those aspects are likely to be much smoother and more seamless with the 855. Qualcomm also demoed vision-related AI features with a company called Nalbi, showing how one can change their hair colour virtually and preview the results on screen in real time, before actually taking the plunge. Yet another demo showed how Qualcomm can use AI to isolate and enhance audio on a VoIP call to make the person sound clearer even if they’re in a very noisy environment, like a pub or a party. A more advanced voice assistant is also in the offing, using dedicated AI acceleration for noise cancellation so users can take to their faithful virtual assistants in noisy places too. The camera capabilities of smartphones utilising the Snapdragon 855 chip would also see tons of improvements. The chipset component responsible for this is the new Spectra 380 ISP, which promises advanced computation photography features along with significant power savings. Hardware-based depth sensing will allow users to replace objects or backgrounds in captured 4K HDR videos, all in real time. Further, the Spectra 380 ISP even supports video recording in HDR10+, and adds hardware acceleration for the HEIF file format for images for reducing file sizes without affecting quality. Lastly, mobile gamers and those who use their phones for viewing movies and TV shows on the go have a lot to be happy about too. The SD 855 chip offers what the company calls its Snapdragon Elite Gaming Experience, which includes support for the Vulkan 1.1 graphics library and cinematic colour grading in true HDR. 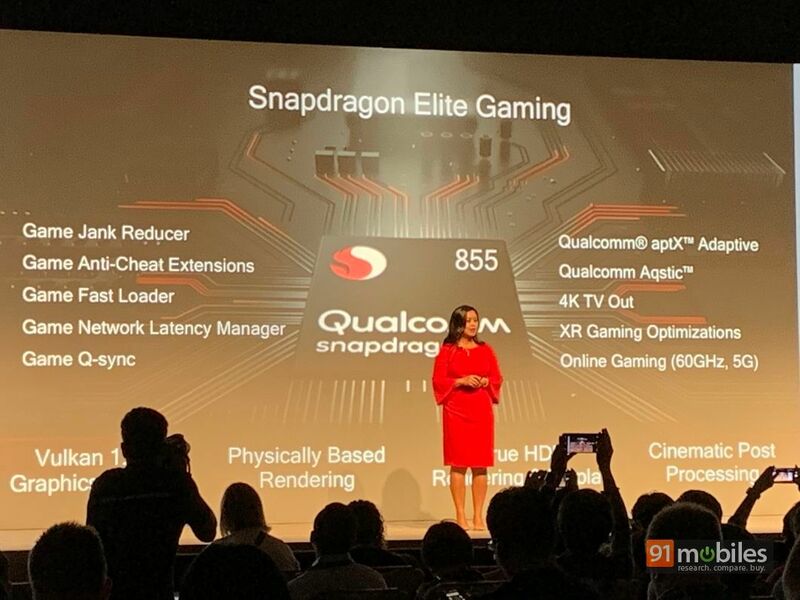 Combined with 5G and the industry-first 802.11ay 60GHz Wi-Fi, Qualcomm is claiming a big reduction in latency, an aspect that has been the nemesis of gamers for a long time, especially those into multiplayer gaming. Even the audio aspect has been improved with the introduction of the new aptX Adaptive audio codec and support for Qualcomm TrueWireless Stereo Plus. As per the brand, the SD 855 chip will be able to deliver HDR video at 120 fps, and 360-degree video at a whopping 8K resolution. The hardware-accelerated H.265 and VP9 video support also promise 7X improvement in power consumption. 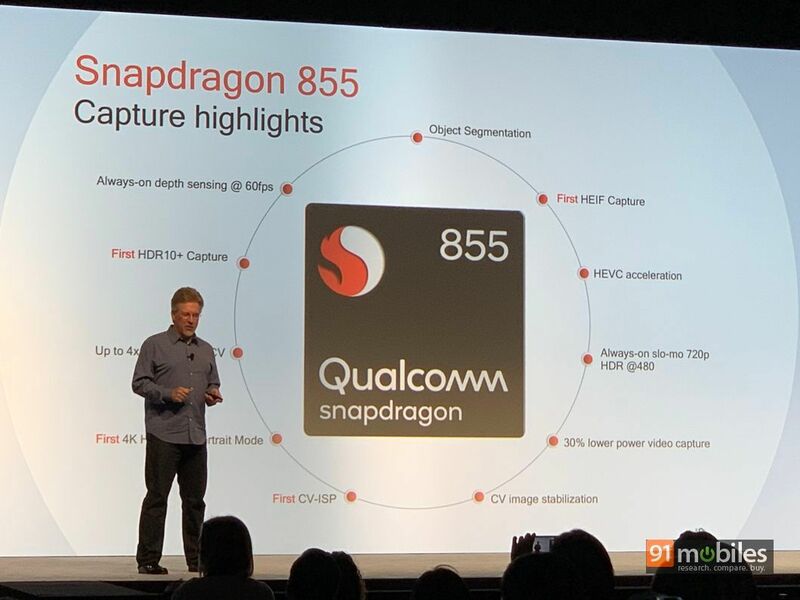 The above are the Snapdragon 855 chip’s capabilities in a nutshell, and looking at these, it seems clear that the new SoC seems more than just a generational leap. It does promise the world, and while it is up to the smartphone manufacturers on how they implement the available features and the specific capabilities they actually make use of in their next-gen devices, the 855 platform seems to have upped the ante quite a bit in terms of what we can expect from a mobile chipset.